Marelon® is a proprietary formulation of polymer composite compounds used to produce superior marine-grade products for above and below the waterline. Created specifically for precision molded plumbing systems, Marelon® offers complete freedom from corrosion and the ravages of electrolysis. At least half the weight of their bronze counterparts, Marelon® plumbing components provide strength, light weight and internationally approved underwater systems that provide years of trouble-free, corrosion-free and electrolysis-free use. Routine lubrication of marine seacocks (Marelon®, bronze or stainless steel on all valves) in any boat is vital for their prolonged life and ease of operation. If ball seals are allowed to dry out, you will experience increased drag caused by marine growth which scores the seals and ultimately leads to leaks, difficulty in operation and/or blockage – potentially harming the equipment they serve. Open valve, to drain any residual water, then close valve and remove the hose from the TOP of the hose line connection. On drains or other easily accessible thru-hull/valve hose lines, you may not need to remove the hose. During this step, it’s wise to check for worn hose and rusty hose clamps. Outside of the hull have a second person use a bucket to catch the run-off MareLube™ Liquid as the valve is opened and closed. Catch the lube as it runs through the line for re-use on the next line. Be sure you are under the correct thru-hull before starting! Repeat the process on all the thru-hull/valve hose lines. MareLube™ Liquid is not harmful to the environment so don’t worry if some splashes. This process requires two people. This procedure is easy and should be done at the beginning of the dry storage season and again before launch. The MareLube™ liquid will leave a PTFE coating throughout the line and help keep hoses clean. Accessibility to all valves is important and essential for the safety of the vessel should disaster strike. Any marine valve regardless of material, if not activated periodically, will seize, have marine growth build up inside and be rendered inoperable due to neglect. It is strongly recommended to be particularly watchful of those hard-to-reach valves and find a way to reach them, since regular activating, servicing or closing them in an emergency is important. 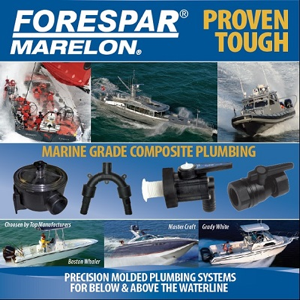 Forespar® provides Marelon® plumbing systems to the world’s top boat builders and continues to develop modern alternatives to age old heavy bronze fittings. We are the only manufacturer to offer motorized Marelon® seacocks (ROV systems) that meet and exceed all Marine U.L., ABYC and ISO standards. Forespar® has products to answer every boaters needs! To learn more, visit http://www.forespar.com/what-is-marelon.shtml. Mike Dwight June 9, 2015 Category: Uncategorized.